It's that time of year again. 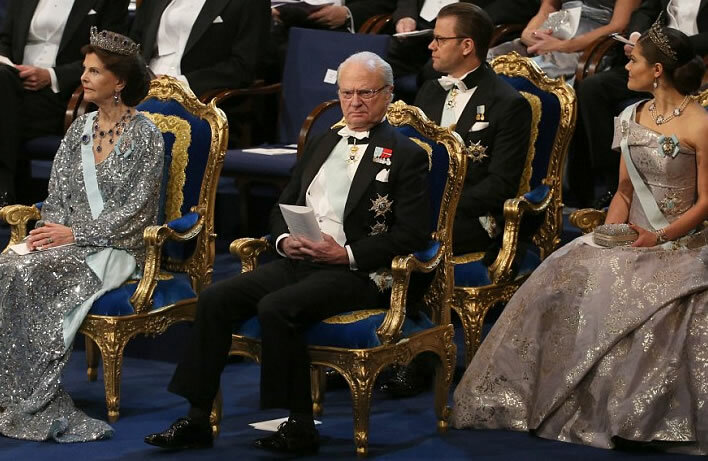 King Carl XVI Gustaf of Sweden, still presumably unwashed, presides greenly and grimly over that fest of modest virtue the Nobel Prize Ceremony. The event is an eloquent demonstration of the power of social convention. The participants dress, eat and comport themselves unimaginatively according to certain historical codes. The surroundings are a display of pomp and spending power – the royal fundaments rest on chairs which would not be out of place at any of the French courts of the 18th century: not a comfy Swedish flatpack in sight. We expect to see the bottoms of Saudi royals and the assorted dictators of the world unashamedly resting on such chairs, but even the rulers of modern, allegedly civilised countries appear not to mind having this execrable stuff in their photo opportunities. 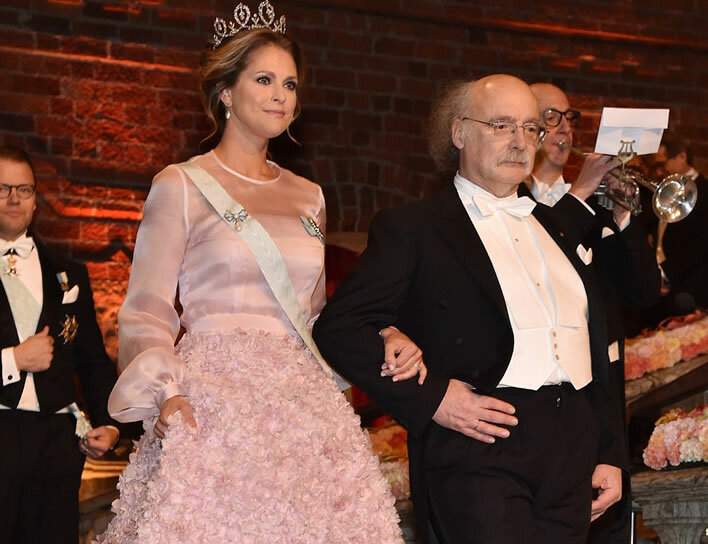 The pantomime season is, after all, upon us and the royal house of Sweden leads the way. The whole thing is a satire that for some reason is still taken seriously. Otherwise 'intelligent' people are happy to turn up and put their conformity on show by parading about in ridiculous clothes. The discoveries that got the prize-winners here were probably made whilst they were wearing old pullovers and gardening trousers. Even the facial expressions on display conform to certain conventions: Professor Cuthbert Calculus F. Duncan Haldane, for example, does his best to wear a dignified expression despite his recent accident with a Van der Graaf generator. It takes a clever man to remain sternly gracious when a trumpet goes off next to his ear and even the old appendix is playing up, too. The banquet has been created at immense expense. Its hypocrisy, pretension and affectations are beyond mockery. A full-day Nobel Week Dialogue seminar entitled Your Plate. Our Planet. The Future of Food. is taking place to puzzle over 'today’s unsustainable food system, which creates both abundance and starvation'. We only need to note the use of the word 'planet' to know what that will all be about. 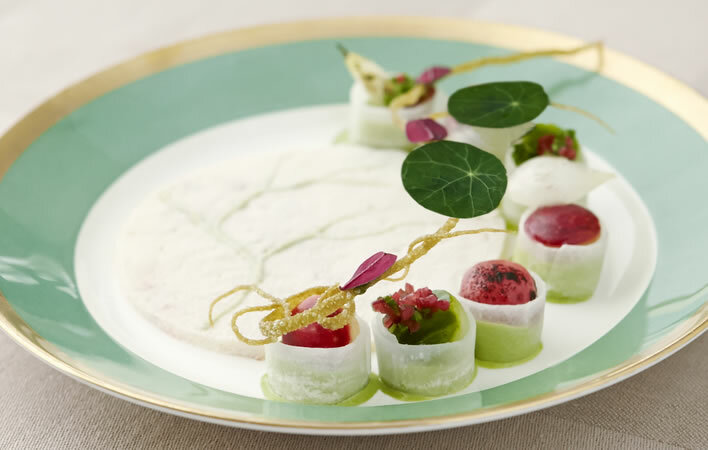 Unlike the starving poor of the world the Nobel diners will not exactly go hungry, but after these complex and dainty morsels a takeaway pizza might lighten the spirits. Charcoal baked langoustine and scallop, served with nettles, ramson and pickled winter apples. ©Nobel Media AB 2016, Photo Dan Lepp. 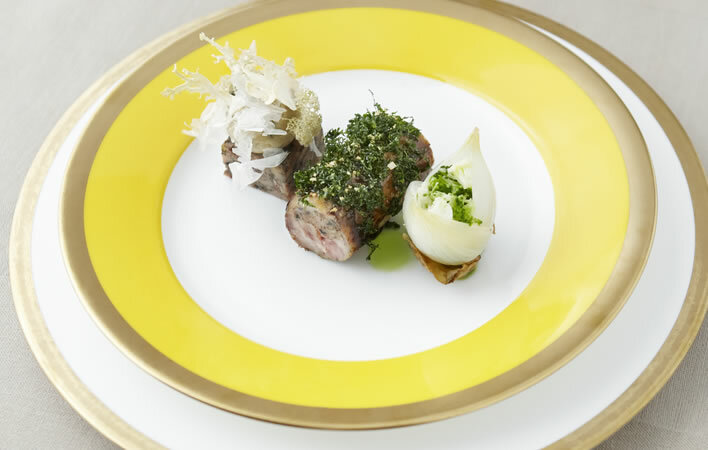 Quail from Södermanland in black garlic and leek ash with Jerusalem artichoke, preserved wild mushrooms and jus of roasted chicken skin and mustard seed. 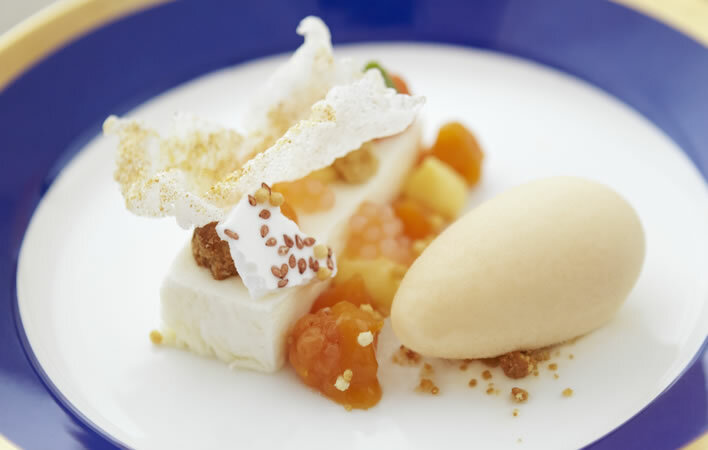 Cloud of sudachi fruit, cloudberry sorbet, miso crumbs and deep-fried rice paper. Still, we are sure that nearly all the participants arrived on bikes.